Born September 17, 1937, Marie Juanico has been an active potter since 1962. She learned the craft from her mother, Delores Sanchez and taught the craft to her daughter Delores Aragon. Her favorite designs are Mimbres animals, parrots, rainblows and snowflakes. The awards she has received for her work are too numerous to mention, but include ribbons at the annual Indian Market in Santa Fe, the New Mexico State Fair and the Gallup Inter-tribal Ceremonial in Gallup, New Mexico. Her work is shown in some of the finer galleries in the Southwest and her pieces are in renowned museums and private collections.�Photographs of four of Marie's pots are shown on pages�159 & 160�of Dr. Gregory Schaaf's book Southern Pueblo Pottery: 2,000 Artist Biographies. A portion of Marie's listing in that book �shows as a scanned image on our product page for Dr. Schaaf's book. This is Marie's classic parrot and rainbow design. Her natural mineral pigment paints are rich in color and exude clarity�against the background of her creamy white slip. 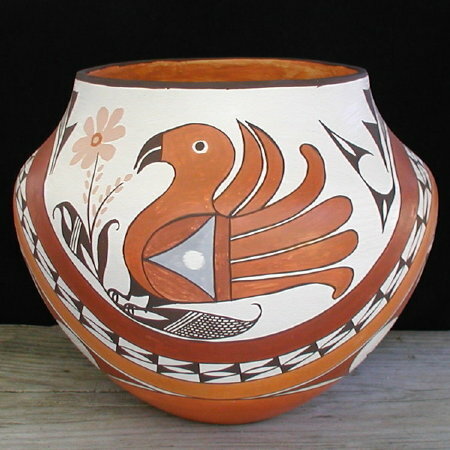 She used the classic Acoma thin orange slip around the bottom of the pot and also on the inside rim of the pot in a band about 1 1/2" wide. This is a classic pot from a woman who has been potting for fifty years. This is a wholly hand-coiled pot made from clay collected and prepared in�a traditional manner at Acoma Pueblo by Marie Juanico. �������� Height: 7 1/2"��������� Diameter: 8 1/2"��������� Girth in center:�28"
���������������������������� Opening: 5 1/2"��������� Bottom: 2 5/8"